What does STEM look like in preschool? The simplest way to think about STEM is to consider the steps of the scientific method. Children learn to define problems and ask pointed questions, state hypotheses, determine methods for discovery that account for variables and follow logical processes, experiment and organize the results to form conclusions. These critical thinking and evaluation skills are executive functions that cut beyond traditional STEM fields to add value in other areas, like social science, literacy and responsible citizenship. According to the Early Childhood STEM Working Group organized by the Erikson Institute at the University of Chicago, “parents play a key role in shaping children’s early experiences in STEM at home, and in creating demand for high quality STEM education in their children’s early childhood settings.” Quality STEM experiences at home or in a preschool setting require adults who look at science as more than a set of discrete facts. Young children possess a natural curiosity that makes STEM a perfect fit, but curiosity is not enough. Scientific thinking must guide STEM processes. Without adult guidance, children may give up if they do not find an answer immediately. They need adult help to sustain the process, model questioning, define the problem and identify helpful tools. However, it is important for adults to avoid quick corrections of children’s processes and thinking. Part of learning is allowing the process to be “messy” in the beginning and leaving room for children to arrive at their own conclusions. Figuring out how to make something stand on its own is an early childhood engineering project. Building together with your child helps them learn basic engineering tenets. 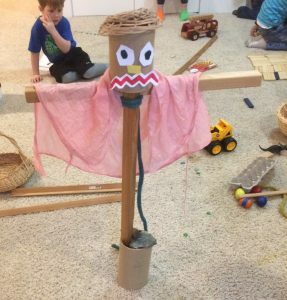 This past year at Wildwood Nature School, a girl decided that she wanted to build a scarecrow from the long blocks we usually use to build marble ramps. However, she was having trouble getting it to stand up. After some back and forth questioning with a teacher, another child who was listening to the exchange remarked that the scarecrow would never stand with just two legs. She knew from a previous building project that three legs would make it more stable. After the second child joined the discussion, they ultimately landed on a different solution, filling a tube with rocks and sliding the scarecrow into the tube. (See the picture at left.) The discussion about what was needed to make the scarecrow stand was just as important from a learning stand point as the final decision. 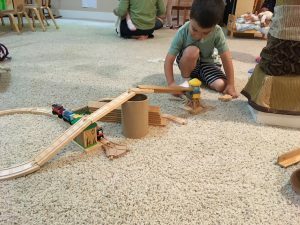 Another example comes from a child who wanted to build a roller coaster with standard railroad track blocks. He was having trouble because the tracks kept separating as he tried to build ramps up into the air. Some questioning from the teacher (What is making the tracks fall? What would make it easier for them to stay together?) helped him see that he needed graduated supports all along the ramp rather than just at the top point of the ramp. His solution is in the picture below. Turning a train into a roller coaster by adding supports for ramps. Representation and communication are key to STEM learning. Hands-on experiences by themselves are not enough. Organizing the results of an investigation, through graphing or drawing for example, helps children conceptualize their understandings. It also helps them notice patterns and changes over time that may not be apparent in a one-off hands-on experience. For young children, the recording may be a group activity, as when the teacher writes the results of the children’s experiment on a chart while they tell her what to write or it can be a child’s drawing of what occurred in the experiment. Adults’ beliefs and attitudes about STEM affect children’s beliefs. Children’s attitudes about whether or not they are capable of doing something or even whether that something is worth doing, are formed early. If adults are anxious about math and science, they are either unlikely to engage in such activities with children or are likely to pass on their anxieties. A 2015 study published in Psychological Science found that when math anxious parents helped their children with math homework, it had a negative effect on children’s math achievement. So, dig in, parents! The beauty of STEM thinking is that it is supposed to be a process of trial and error. Good science occurs when you don’t know what the results of your experiment will be, when something fails and you are able to discover why and redesign your experiment. Children need to see parents and teachers modeling this process of learning from mistakes. STEM education is critically important for all children. Science, technology, engineering and mathematics hold the jobs of the future. More importantly, the critical thinking skills children develop through STEM will help them in no matter what field they choose to pursue. Parents play a key part in nurturing STEM at home and in working with schools to ensure more formal STEM learning happens for their children’s formal schooling.